Remember when They were spiders a few weeks ago? Remember when I said I was still picking thread from things days later? Really, I still am, but I just don’t say much, I just grump and grumble, checking my clothes before I leave the house for any stray “webs” and roll the remnants of the Spinnerettes into little knots and toss em away. Well, tonite, my vacuum had enough. Done. Kaput. Gave up the ghost. Made the ultimate sacrifice. Giving the play room a once over, I headed into the guest room, and before I knew what was happening, yet another spool of thread was flying maniacally across the room, sucked into the twirling voracious rpm’s of the vacuum. Ever seen it? It would be kinda fun, the way the spool bounces across the room and hits the walls, willy-nilly, if only the vacuum wouldn’t then make that awful noise. That horrid noise, followed by the acrid smell of electric things getting too toasty. In the fraction of a second it took me to kick the kill switch on ol Bessie, she sucked down almost a whole spool of nice, tan, cotton quilting thread. Thick thread, in case you’re not in the know. Rrrrrrrrr Kzkkkkkaaaaaa. Grind. Wheeze. Silence. The Legend of the Spinnerette’s lives on. Ol’ Bessie has left the building. Go read this. Just do it. Ta-da! I did it! Now I know you all were expecting some sort of rhinestone encrusted Elton John jobby, so don’t be disappointed. I’m crummy at this digital photography thing (give me an SLR any day!) and I didn’t get the rhinestone heart on the left lens to show up well. Oops. But it’s there, you can see it. I guess it’t the right lens in the picture! For me, these are flaming flamboyant! 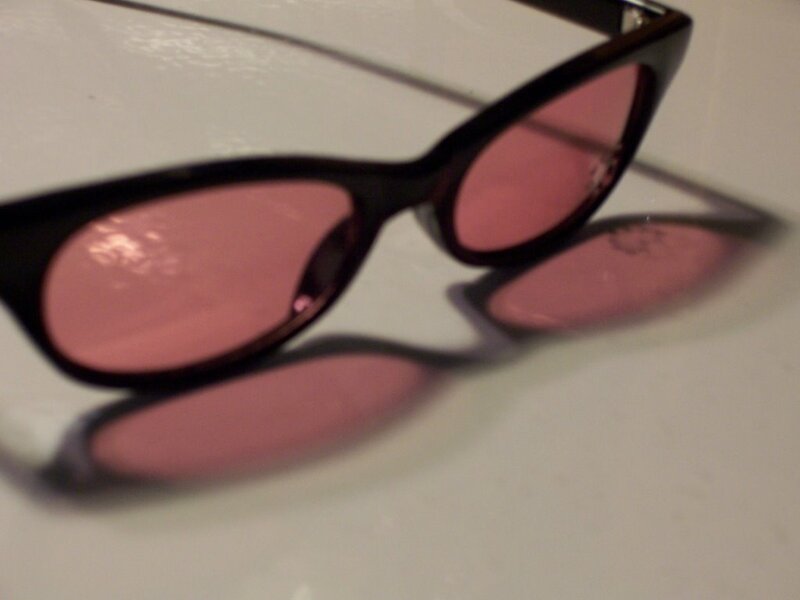 And who doesn’t love the world better looking through rose-colored glasses? My daughter is bringing out something surprising in me: I am softening towards things pink and, maybe, just maybe, I am enjoying, a little bit more than I used to, being a girl. I’ve always wanted to be more adventurous than I am. To have the courage to be less than ordinary. My wild curly hair has kind of forced a crazy look on me, but I always wanted to be more Carrie than Charlotte. So now that I have a daughter, I am aware of how I feel about being a woman and mother is going have a direct bearing on how she learns and see’s herself. It is also causing me to re-examine my own relationship with my mother, and try and cull the good things worth keeping, but that’s another idea for another day. It’s not that I want my daughter to think she has to be made-up and in a pink rhinestone sweater to be feminine. Not at all. But I’m thinking I have been kind of lopsided in my femininity- my intellect is nurtured, by creativity is nurtured, but I often neglect the parts of being a girl that can be fun, too. I can read Goethe and Dostoevsky, run my own business, be woman of faith, a mother, a wife AND sometimes sport pink rhinestone sunglasses. Here’s to breaking down our own barriers, whimsey and being well-rounded!